“The Woods”, an impenetrable wilderness wasteland with dangers such as dead and falling trees Misused as a dumping ground prior to cleaning and clearing in 1994. “The Woods” in the process of clearing and clean-up, 1994-1998. Mary Lou Marzian, State Representative, 34th district, Tim Shaughnessy, State Senator, 34th District, Robert Griffith, Attorney for Warheim Park, Tom Owen, Metro Government Councilman, 8th District, and Bob Hill, Journalist, Courier-Journal listen as Hal Warheim, Warheim Park President, starts the ceremony. Park Board of Directors Sarah Kuhn, Larry Lenahan, and Sally McMahon break ground while Jocelyn Warren and Jim Watson wait their turn. Park Sponsors Tim Shaughnessy, State Senator, 34th District, Mary Lou Marzian, State Representative, 34th District, Tom Owen, Metro Government Councilman, 8th District break ground for the new neighborhood park. Don Osborn, President of the Belknap Neighborhood Association and Bill Allison, former 3rd Ward Alderman break ground while city and state officials Tim Shaughnessy, Mary Lou Marzian and Tom Owen applaud. Limestone retaining wall for the Pavilion Shelter. Limestone in large natural shapes are brought in by the truck load. Neighbors view construction of the bridge connecting the Play Area with the Pavilion. 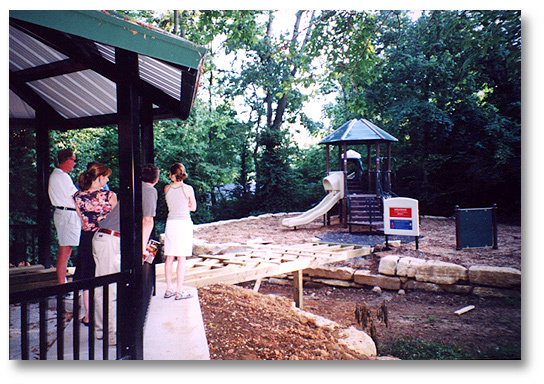 The Children’s play area as seen from the Pavilion. The Board of Directors and Fundraising Volunteers meet to promote the park’s progress.